Yeah. We didn't hear that either. Like only a handful of animals, including whales and elephants, the okapi emits sound waves that are actually below the range of human hearing. You would need very specialized equipment to hear what he's trying to say. Like the ears and mind of an actual okapi. But that's OK. This rare animal also speaks the universal language of beauty. 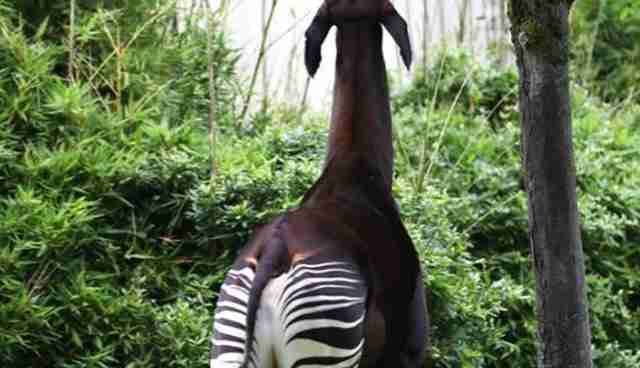 At around 6 feet tall at the shoulder, the okapi may seem like a patchwork quilt of other more familiar animals: the stripes of a zebra, the body of a horse, the face of a giraffe. 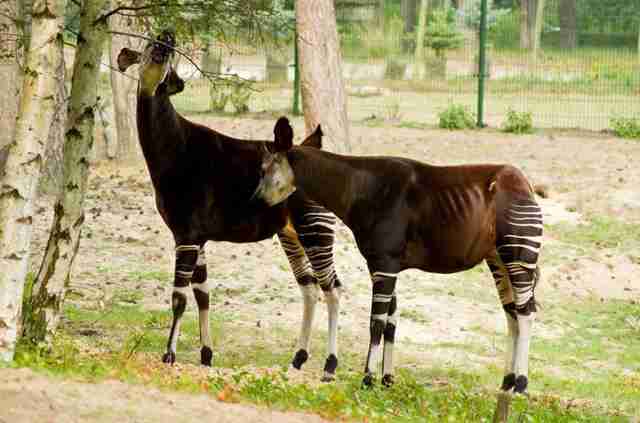 Besides his secret subsonic language, the okapi also slings the usual bleats and whistles that you might hear from a giraffe. That's because of all the animals he resembles, the giraffe is his closest relation. In fact, he's often called a "forest giraffe." We know what you're thinking. Ummm ... neck? Call it an evolution of convenience. 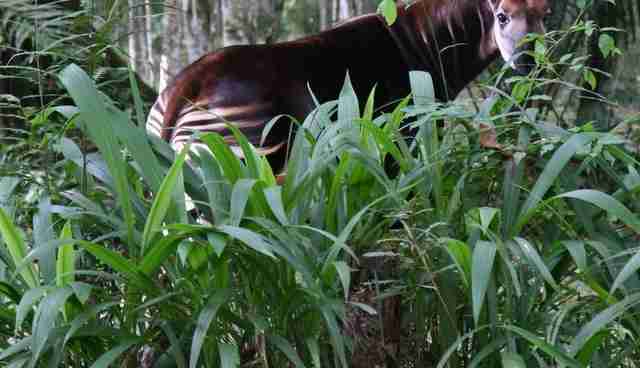 The okapi is confined to the lowland rainforests of the Democratic Republic of the Congo (DRC), a place where vegetation - he mulches between 40 and 65 pounds of foliage daily - is within easy reach. He doesn't have to stretch into the upper altitudes for hard-to-reach food. 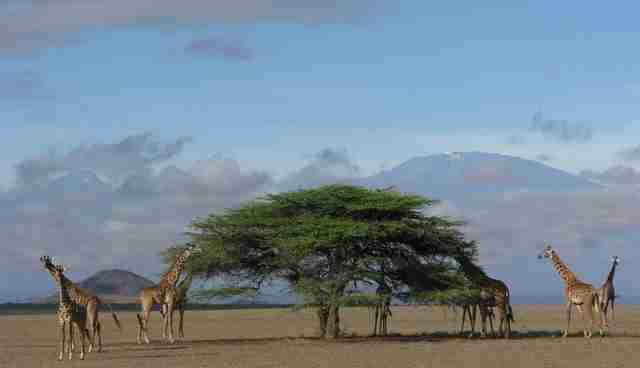 While there's some debate about how the giraffe developed his trademark neck, many naturalists suggest it was genetically inherited over generations to help him find food where no other animals could. 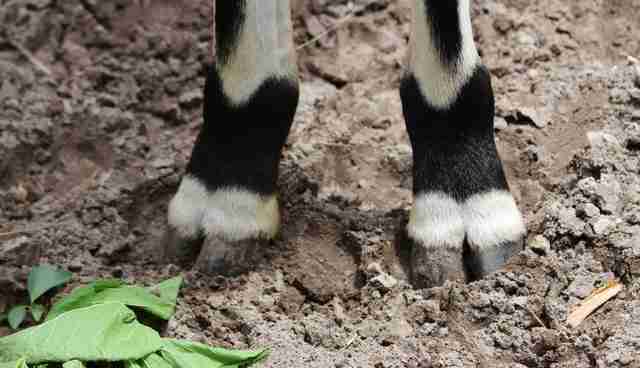 Life may have been just a little easier for the okapi. But that may be the only thing. Since 2005, the okapi population has dwindled by 50 percent - an alarming trend that places the animal squarely in the endangered category of the International Union for Conservation of Nature (IUCN) Red List. That's the organization's third most urgent category, only two steps away from "extinct in the wild." Poaching and habitat loss, the usual suspects, are responsible for reducing the population to somewhere around 20,000 today. The civil war that ravaged the DRC, ending at last in the early 2000s, is cited as a major factor in the animal's stunning decline. 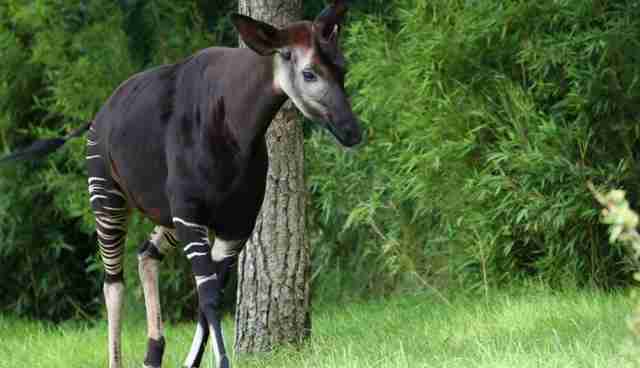 "The okapi is revered in Congo as a national symbol,"okapi expert Noëlle Kümpel told Nature World News. "It even features on the Congolese franc banknotes. "Sadly, DRC has been caught up in civil conflict and ravaged by poverty for nearly two decades, leading to widespread degradation of okapi habitat and hunting for its meat and skin." 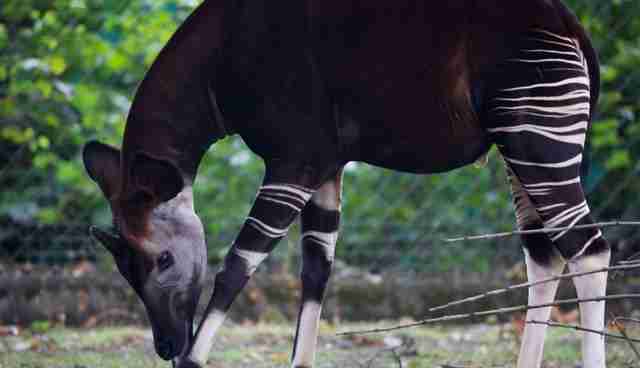 We may not to be able to hear the okapi's secret language, but he has found another kind of voice in sanctuaries like the Okapi Conservation Project. The refuge, a 5,300-mile swathe of forests in northern Congo, is dedicated to protecting the okapi by working with government agencies to guard against poaching while finding ways for local communities to live harmoniously alongside the animal. "The endangered okapi is an umbrella species," Lucas Meers, conservation program manager at the Okapi Conservation Project, tells The Dodo, "And by protecting these magnificent animals is critical to the preservation of the biodiversity of the rainforests in central Africa and the communities that live within them." It's easy to see why the surreal beauty of this elusive forest dweller is worth protecting. If you would like to support the group and its mission to save this natural wonder, consider making a donation here.